Several users reported that they want a more “flexible” ACL system, based not on groups of “things they can do”, based on every page a profile could see (and operate), item by item, page by page. Current ACL model is based on “unix style” role/action/group/user (4 items), new system will allow to define per profile, which pages (defined one by one or by “groups”) has user access. This will allow for example, to let a user view only “Group” view, and “Detailed” agent view, skipping pages as “Alert view” or “Monitor view”, grouped already in Pandora FMS classic ACL system as “AR” (Agent Read privileges). 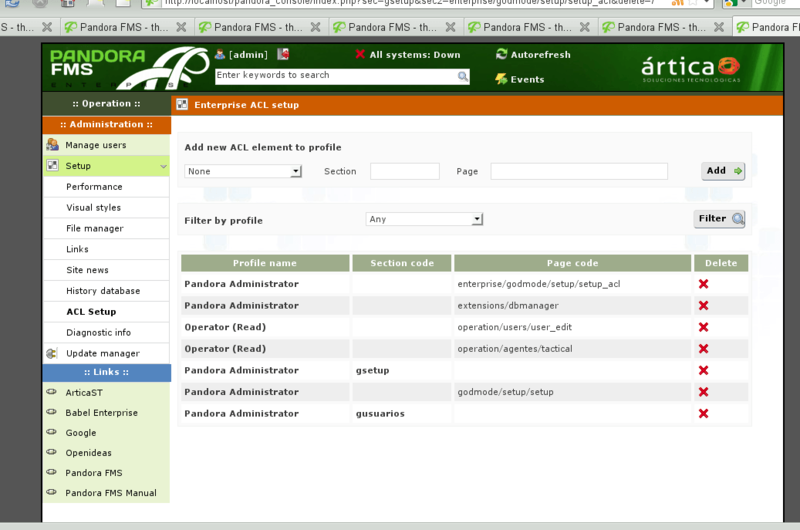 This even allow to restrict administration per page. Very useful to let specific low-level operations allowed. Both models are “paralel” and compatible, and this is an Enteprise feature only ;-). Classic ACL system will continue to exist, and provides as now, a very easy ACL system for Pandora FMS.